Ryan Preece is now $100,000 richer. 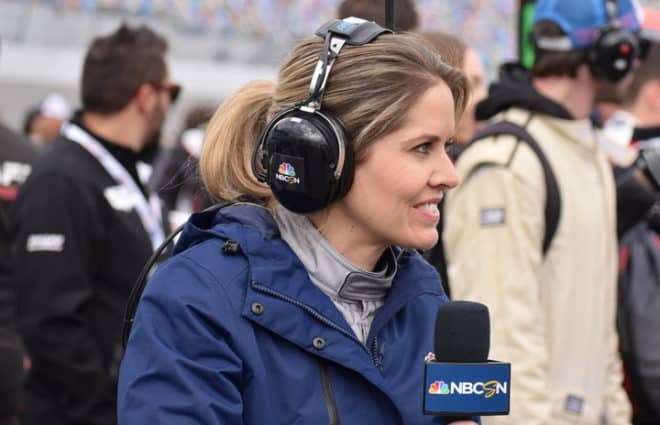 The part-time driver of Joe Gibbs Racing No. 18 won the Fitzgerald Glider Kits 300 at Bristol Motor Speedway on Saturday afternoon (April 14), his second career win. 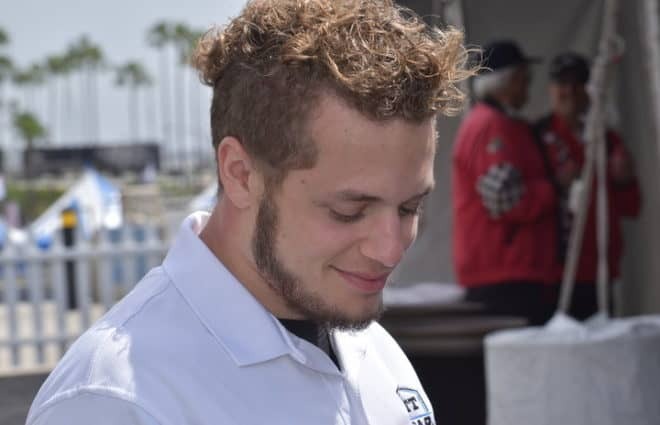 Preece also won the NASCAR XFINITY Series’ Dash 4 Cash prize of $100,000 by beating out Daniel Hemric, Cole Custer and Christopher Bell. “I can officially say that I’m gonna be paid off for everything that I risked last year,” Preece said. Last season, Preece said he borrowed money from a friend to run two races for JGR. The money won from this race will go toward paying off that debt. It looked like Preece’s teammate Brandon Jones was off to his first career win; he had a huge lead over the field and had lapped up to the seventh position before a caution flew with 18 laps remaining. Jones took two tires under the caution, while Preece changed all four. Preece used the fresh rubber to grab the lead from Jones and held off a late charge from Justin Allgaier to snag the win. “[Crew chief Eric Phillips] gave me a real great set of match tires there at the end, and they came through for me,” Preece said. Custer started the race on the pole, but Allgaier took the lead from him on the initial start. The Bristol carnage started early; there was a nine-car pileup on lap 5 that totaled Jeremy Clements and collected Dash 4 Cash contender Bell. Allgaier maintained his lead on the restart, and Hemric moved into second place but was gapped by the No. 7 by more than a four seconds prior to the lap 45 competition caution. Allgaier had lapped approximately one half of the field in that span. Hemric and Bell stayed out during the caution to assume the top spots, and Bell quickly willed his way around Hemric on the outside. The caution came out a few laps later when Allgaier and Matt Tifft connected, causing Tifft and Sadler to spin into the wall. The race restarted with 20 to go in Stage 1, but didn’t make a lap before Tifft blew a tire and hit the wall. The green flag flew again with 12 to go in the stage; Bell got the jump, but Hemric stayed close. Hemric gave Bell a shot to the bumper but was unable to complete the pass. Bell won Stage 1, followed by Hemric, Custer and Preece — a clean sweep by the Dash 4 Cash competitors. Austin Cindric finished the stage in sixth, followed by John Hunter Nemechek, Shane Lee, Ryan Reed, Ryan Truex and Allgaier. Preece grabbed the lead by staying out under caution, while Bell pitted and fell back to fifth. The race restarted on lap 99, and two laps later, Allgaier came down on Jones and spun into the inside wall. Allgaier was in the top five when it happened and it resulted in a massive pileup behind him. Hemric stole the lead from Preece using the bottom on the restart on lap 25 of Stage 2 and went on to lead much of the stage. 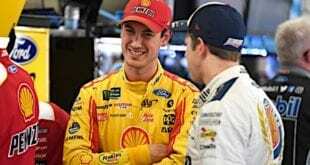 Bell’s hopes for winning the cash were dashed on lap 141. Vinnie Miller and Cody Ware collided right in front of the No. 20. Bell locked up the brakes and spun the car so that the right side of his car slammed into the pair, knocking him out of the race and bringing out the red flag. 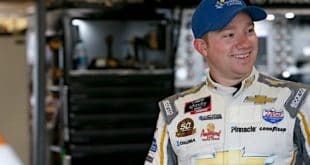 Not only did the wreck ruin Bell’s shot at this week’s Dash 4 Cash, but he will not be able to compete for it at Richmond Raceway because he was not one of the top-three finishers. Cautions continued to breed cautions; as soon as the race restarted, Dylan Lupton laid oil down on the track to bring out another yellow. 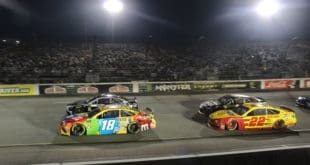 Hemric defended his lead initially on the restart with nine to go in Stage 2, but Preece stayed with him and pulled off a bump-and-run to grab the lead one lap later. Preece cruised to the stage win, followed by Hemric, and Allgaier recovered from early race troubles to place third. Lee and Cindric rounded out the top five. Nemechek, Ross Chastain, Truex, Spencer Gallagher and Chase Briscoe also picked up stage points. Custer and Sadler were in a position to earn stage points when Sadler booted Custer out of the way and into the wall. Custer fell to 13th, while Sadler’s tire went down. Preece dropped to ninth when he pitted during the stage break and eight other cars, led by Briscoe, stayed out. Briscoe led for a few laps after the restart, but Jones eventually overtook him. Briscoe dropped to third and then brought out the next caution when Hemric dumped him. Jones fended off Preece on the restart, despite having older tires. 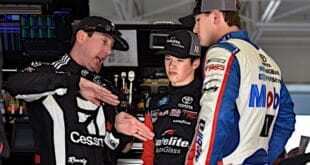 He led 45 straight laps before Preece reeled him back in. Preece rode behind Jones for the next 55 laps, but couldn’t get around him. It looked like Jones was riding off to his first career win, when Lee blew a tire and hit the wall with 18 laps to go in the race. Jones pitted for two tires during the caution, while the rest of the leaders took four. Jones chose the high side for the final restart, with Preece on his inside. The four tires proved to be useful, as Preece took the edge on the restart. Jones gave everything he had to battle Preece for a few laps but didn’t have enough grip to stay with the No. 18. Preece cleared Jones and cruised to the victory and a $100,000 bonus for winning the Dash 4 Cash. 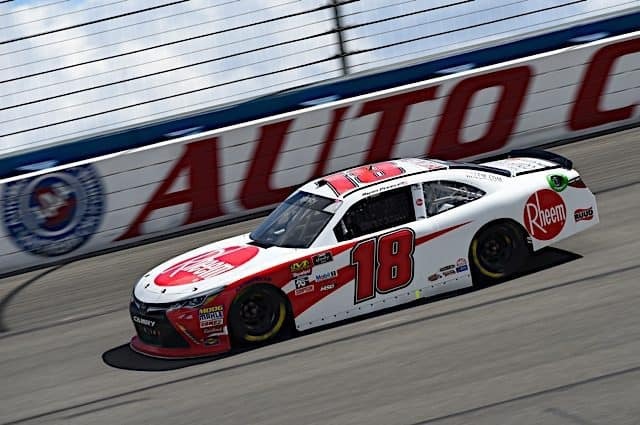 Allgaier ended an eventful day with a runner-up result, while Hemric, Sadler and Gallagher rounded out the top five. 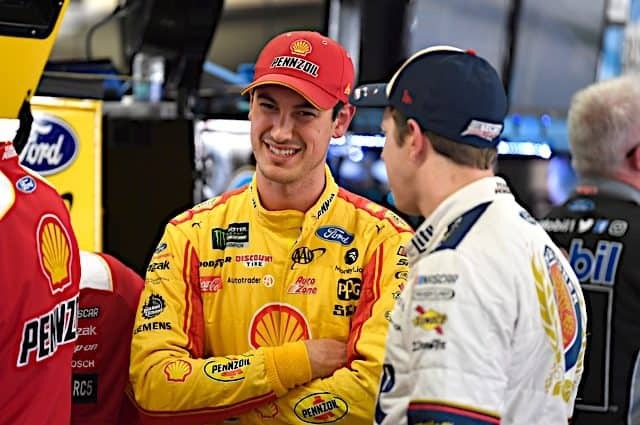 Those four would have competed for the Dash 4 Cash next week at Richmond, but Hemric failed the postrace inspection for mechanical measurements so he will be replaced by Jones. Preece is not entered for Richmond. Jones, on the two older tires, fell back to a sixth-place finish. Reddick, Custer, Chastain and Truex rounded out the top 10. 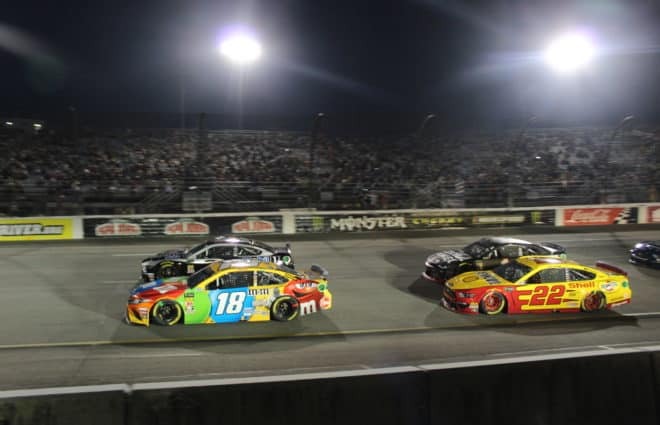 Up next for the XFINITY Series is the ToyotaCare 250 at Richmond Raceway on Friday night (April 20).